Aldacom GmbH, of Neu-Isenburg, Germany, recently announced the debut of the AldaLogic C10/3, a breadboard containing an embedded Linux PC on a surface measuring 104 x 63 millimeters. 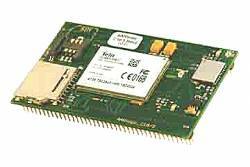 The unit also contains a Quad-band GPRS module and SiRF3 GPS module, as well as interfaces for USB, RS232 and Ethernet components. An SD-card reader enables expansion of the standard 4 Mb of flash memory. At the heart of the PC are two ARM processors, responsible for the GSM component and applications that are executable under Embedded Linux. The processor module, including the GSM component, may be purchased separately. Despite its small surface area, roughly the size of a matchbox, its 160-pin socket provides a wide array of connectivity options, including keyboards, digital cameras, and reading devices, as well as WLAN, Bluetooth and GPS components. Aldacom engineers say the new platform is well-suited to the expansion of self-sufficient monitoring systems and positioning, and capable of more than simply transferring data because of the “Linux Intelligence” locally. “Coupled with a camera or sensors, pattern recognition applications, for example, can be executed directly on the board.As the geo-coordinates are also transferred wirelessly, the board is highly recommended for mobile use,” the company said in a press release. A cost-free test server is available at <www.aldacom.com/aldatrace> for visualization of the geo-data. Aldacom supplies products, services and concepts for industrial users of electronic components with a focus on wireless technologies such as GSM, UMTS, GPS, Bluetooth, ZigBee, WIFI, UWB and ISM. The product portfolio ranges from starter kits to components for mass production.